At the start of March, my social media timelines were awash with parents all experiencing the same level of dread: what to send their children dressed up as for World Book Day. Meg’s school seemed to have quite strict guidelines; the children couldn’t just dress up as any old character, they had to be able to provide the book which contained the person or thing they were dressed as and they had to know the general storyline too. Unfortunately for Meg, despite her protestations that if she had a Rapunzel story it would most definitely be her favourite bedtime book, we had to think creatively. 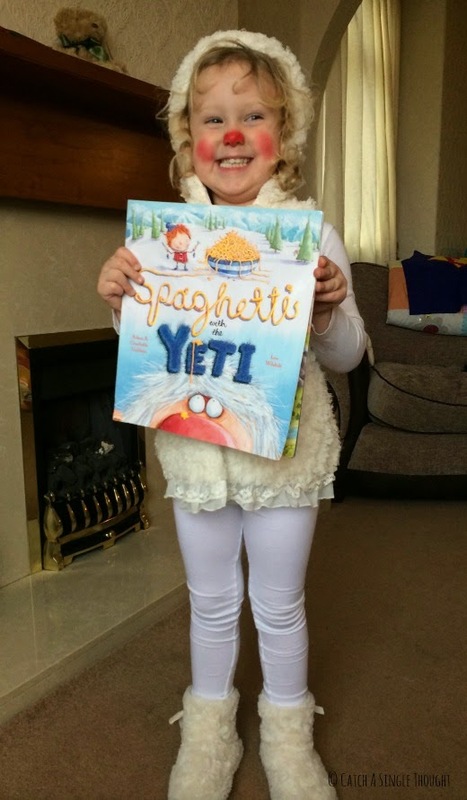 We went through her favourite bedtime stories and eventually settled on Spaghetti with the Yeti. Meg would be the Yeti, which seemed easy enough. On the day itself I was impressed at the range of outfit choices the children (or the parents) had made. I had made an offhand comment to my Other Half about all the girls being princesses and all the boys being pirates (I know, I know, terribly stereotypical of me!) but, as Meg deigned to point out at dinner the following evening, there was actually only one boy dressed as a pirate! In fact, Fancy Dress Ball recently carried out a survey of around 700 parents to find out which fictional characters were their children’s favourites and the results show a really great mix. Harry Potter was the clear favourite with 12.60% of the votes, and that was definitely true at Meg’s school; I saw 3 or 4 Harry Potters and a Hermione or two as well. The Gruffalo and Peter Pan came in second and third place with just over 2% of the votes (which shows just how popular HP is!) and interestingly, Noddy is in fourth place. I wouldn’t have thought he was such a common bedtime story choice these days but it’s great to see that a classic character is still holding his own! I have to eat my words twice over as well, as only one Disney Princess features on the Top 20 list. I would definitely have expected that to have been a more popular choice. Although I appreciate that for some parents, dressing their children up is a total headache, I think it’s a great way of celebrating the stories that we love to read with our children and I, for one, am a massive fan. There was a little complaint from Meg that nobody seemed to know the story in her class (it’s a small village school so we have to forgive them) but to be honest I liked that it was unknown and I hope that because Meg’s choice was something new and different that a few children went home and asked their parents if they could read it to them, as it’s a firm favourite in our house. It would be amazing to think that we have managed to share a book which is really well loved in this house. Meg came home with a few new requests herself, which I thought was fantastic. Perhaps unsurprisingly though one of those was Rapunzel…I suspect she’s planning ahead and getting her outfit request ready for next year!